That was yelled at me in a disgusted tone after I tracked down Charlie and reminded him he couldn’t eat a piece of the animal cake served at the party. I felt awful. I had went around and around with him that he would eat only the cake I brought and he seemed to understand but I still hovered and didn’t trust him to do the right thing. As my good friend pointed out “He’s 4. He can’t be trusted”. It’s true. It didn’t help the guilt that I felt. Here’s the thing. As a food allergy parent, I HAVE TO TRUST MY CHILD. I need to know that he will make good choices or I will probably go insane. Quickly. I need to know that he is listening and he understands the severity of his condition. I’ll repeat that….. my four year old needs to be responsible for his life. Although I have a wonderful community that keeps an eye out for him and does everything in their power to keep him safe, Charlie still needs to be the person that knows what he can and can’t put in his mouth. Or up his nose for that matter. He needs to know to ask about ingredients and he needs to know what ingredients he can’t have. In some ways we are lucky. Charlie had his first allergic reaction at the ripe old age of 13 months. He doesn’t know what life is without an allergy. The rules and habits we’ve established are all he’s ever known. He doesn’t long for his favorite candy bar or ice cream he can no longer eat. He won’t know what it is like to go somewhere without his epipen. He will always be the kid with the “special snack”. That’s just his life. At the age of four, he knows he can’t eat peanuts. He knows how to administer an epipen. HE KNOWS HOW TO SAVE HIS LIFE. The amount of responsibility and trust that we put onto that little person is astounding. A four year old needs to have the self control of an adult, and more depending on the adult. (I’m looking at you, Stampy). I think that is one thing that is majorly overlooked when we talk about these “food allergy kids” and “food allergy parents”. We miss the amount of trust and responsibility that these kids have at such a young age. And the amount of trust that parents put into their kids at such a young age. It’s not because we want to or even have to. No one is making us trust our children or dole out this responsibility to them, it just comes with the territory. It comes with the epipen. It comes with the allergy. Funny thing, when I tell people that my husband and I are going away I usually get one of two responses. I either get a “good for you!” or a “WTF?”. Rarely is there a reaction in between. That being said, I think leaving the kids is a GOOD THING. In my mind I’m teaching them some great life lessons and hopefully setting them up for future successful relationships. That could also be the beer talking…. With that being said, I give you the 7 reasons I think leaving my kids behind is beneficial. 1. First and Foremost Stampy and I are husband and wife. I used to laugh at the baby advice books that urged me not to neglect my husband. Maybe that’s because it told me that I should simultaneously be nursing a child, changing a diaper and fixing him a sandwich. (ok, maybe not quite that bad, but one was very much pro-serve-your-husband) Down to the nitty gritty it has a good point. To be successful parents and teammates you need to get along. How do you get along? By doing things that you enjoy without someone throwing food on the ground, whining or punching their brother. 2. We are strengthening the grandparent/grandchild bond. Yes, they do see them all week long but there’s nothing wrong with a little extra special one on one time with the grandparents. Even kids need a break from their mundane boring parents that are always telling them to brush their teeth, put their shoes on or go to bed. That is a win-win-win situation. 4. I get two days without reading food labels. Two. Whole. Days. That only means that my food label reading skills will be rested and ready to go when I get back instead of getting half way through the store and realizing everything in the cart has not been checked. Now, everything will be double and triple checked. Thank you rested, non-autopilot brain. 5. I learn to tone down my Type A, hyper-controlling personality. In order to leave your kids and want the grandparents to do it again, you can’t hound them for every time they give Oreo cookies for breakfast. After all, it’s really not my problem when the sugar high kicks in and at least the kids are eating while I’m gone! 6. I can exercise and drink all before 9 AM. That is two things before 9 AM. Two fun things. Usually those two things are drinking cold coffee and losing my mind trying to get the kids ready for school. 7. I realize I miss the bickering and whining. Crazy, right? But removing myself from it actually makes me miss it (really, the kids) which helps me on the days when no one will listen to a word I say, I just think back and remembered that I missed this. I missed the insanity and wanted to come home to it. We got off to a rocky start here, the first three weeks I was yelling once a week. Which was down from the three or four times it was. We hit that third week though and everything started to flow. Now about that time it warmed up about 20 degrees, days got longer and we could go outside. Might have had something to do with the change in my mood but either way, week three through six blew on by. I didn’t take those last three weeks basking in the sun though. Nope, we started potty training and we hit both kids’ (and mine) birthdays and two illnesses. We were busy. 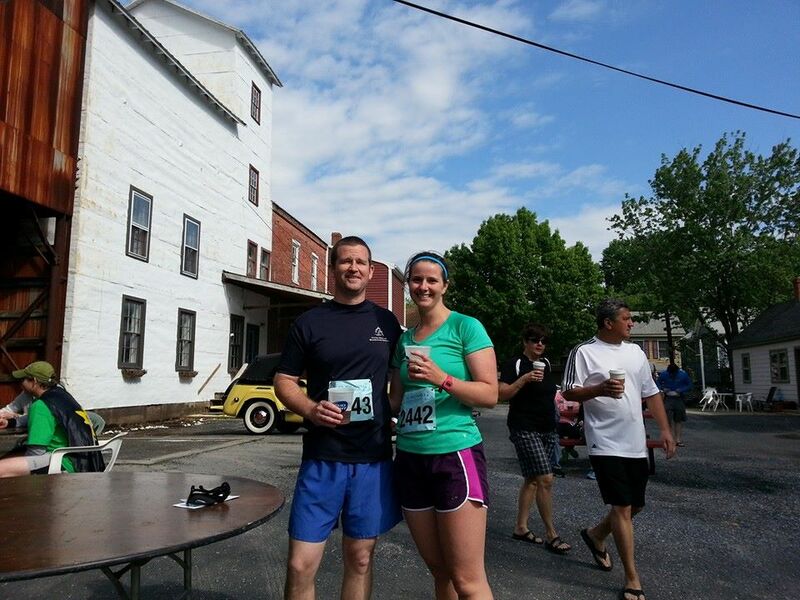 We were running. We were living. I thought I would share a point when I noticed my change had occured. It was two days before mine and Molly’s birthday. I was working 9 hours that day, eleven the next and I had a birthday cake to make. Like all five year old girls, Molly wanted a Thomas cake and since Charlie has food allergies, Stampy and I were left to our own devices to make it. Things were going well that day and I had scheduled myself down to the minute. I knew if I could just get the cake in the oven, my mother-in-law could get it out as she was watching the kids. Turns out I had just enough eggs and cocoa to make one cake. I had just enough time to make one cake. ONE.CAKE. Dry ingredients go into the stand mixer and the rest is Charlie history. FYI, if you leave a stool next to the counter and if the stand mixer is near that stool, a three year old might climb on said stool and turn stand mixer to high. Needless to say my already risen stress level went from 0-60 pretty quickly. Chocolate cake dry ingredients everywhere. Oh, and did I mention the eggs had already gone into the stand mixer?? Yup. 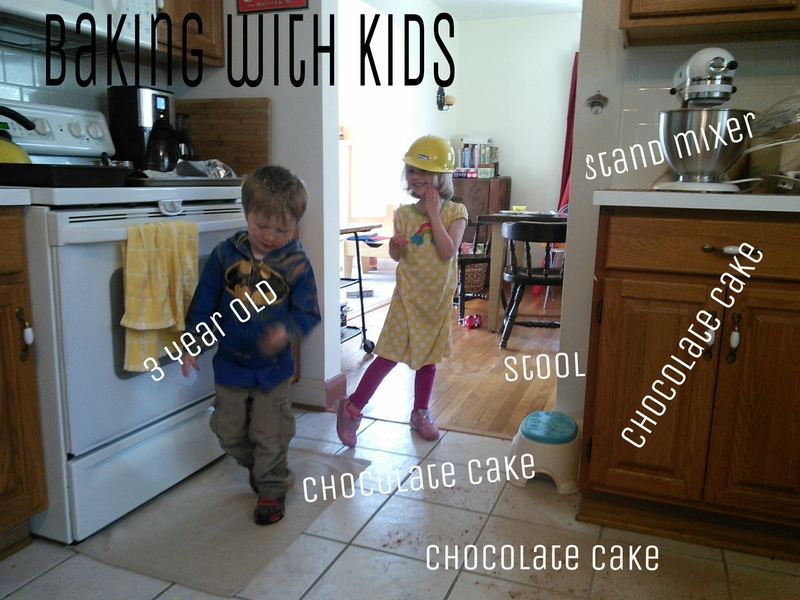 My eggs, cocoa and time were now a dust storm all over my kitchen and three year old. 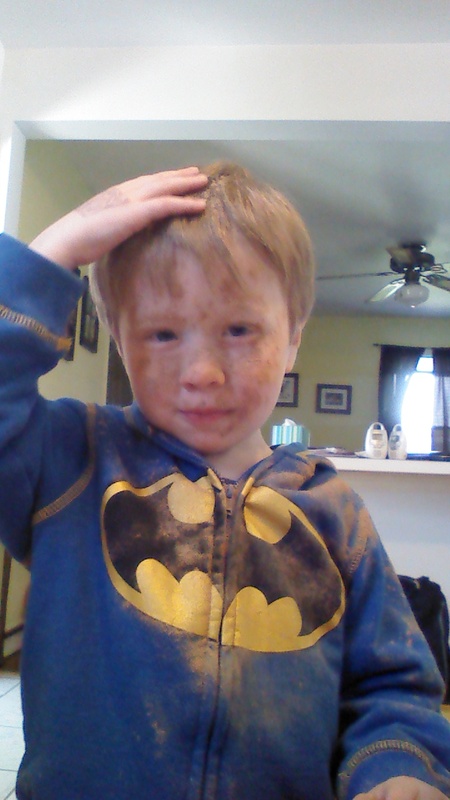 He didn’t have much to say for himself other than “I’m covered in flour!”. I realized that I could yell about what just happened or I could accept what life handed me. I chose to accept what life handed me (seriously, I couldn’t yell at that cocoa covered face) and with that it handed me two awesome in-laws at that moment. That not only got new ingredients but baked a cake and cleaned my kitchen. Yup, that happened to. I was pretty lucky. Did I mention we started potty training that little guy?? I’m sure more will come about that later. You might not know this about your mother, but I was once a picky eater. I once ate spaghetti without sauce, only ate chicken nuggets at restaurants, and would not let a green vegetable pass by my lips. I gagged at all seafood (still do) and I thought chilli was the worst food ever. There were many foods I thought were awful without even trying. Brussell sprouts and mushrooms were on that list. I hated the smell of green peppers cooking and I didn’t eat mayo until… well, I still don’t eat that. I was lied to about ingredients in dishes and your Noni told me that she put chicken in the tuna noodle casserole. I didn’t fall for it. I still don’t eat beans, but that’s probably for the best. I had a brother that ate everything, I hated being compared to him. It wasn’t until college that I ventured into the food world. When I did, I couldn’t believe that I had missed out on wheat bread for so long. I don’t know if it was the fact that I had roommates that ate different foods, or the fact that I wanted to fit in, or that I was older or that I was exposed to new foods, but I learned that the worst that could happen is that I wouldn’t like it and then I didn’t have to eat it again. Since then I’ve discovered fresh vegetables, pesto, chorizo, and NUTELLA! I was too scared to eat nutella. That was just insane. It will be another several years before I actually develop a healthy relationship with food and the girl that is still made fun of for asking “how do I boil water?”, is now the woman baking your bread, roasting your chicken, braising beef short ribs, making soup from scratch and growing vegetables. My point is, I understand. I empathize. I know your anxiety of new foods and your reluctance to eat. I get it. And after twenty years of stressful meal times I don’t plan on starting that up again. Some people will make fun of you, some will call me a bad mom, and some just won’t understand how you couldn’t possibly love shrimp. That’s ok. You’ll come around in your own time. Until then I’m going to put a green bean or a piece of beef on your plate because I won’t know if today is the day you will change your mind. I will do my best to serve you nutritious food that include foods that you will eat and occasionally I will ask you to try something new. I might even forget sometimes and press the issue. I’m your mom, I’m allowed to make mistakes if I feel it’s for your own good. P.S. Your father was a picky eater too, I think he turned out alright too. Shortly after Charlie was born I started attending a yoga class. It was one hour on Sunday and I loved that hour. I could even say that I lived for it. I had a newborn and a 2 year old, so needless to say I had no time to myself other than that class. That hour was all about that hour. I didn’t think about what I had to do after, I didn’t think about what was going on at home and I didn’t think about anything that had happened preceding the class. It was all about the present time. After 2 1/2 years I realized something about yoga, not only do I live for that moment but I don’t criticize myself, I work hard, and I’m proud of what I accomplished. Sometimes it’s just finishing the class without falling on my face. This doesn’t carry over to real life. In real life we are a family that is constantly on the go. I spend my days constantly thinking about what is next. What time someone has to get picked up, what appointment is coming up, when bedtime is, and in doing that I don’t get to enjoy the present moment. I don’t worry about an upcoming Reverse Triangle while breathing in Child’s Pose, why should I worry about the future in real life? I find myself overwhelmed by cleaning things out. Therefore, nothing gets cleaned out. I worry that the crew from Hoarders will show up at my house but still I can’t let go of things. I find sentiment in everything that I’ve ever done. I made connections with any outfit my kids donned. In doing this, I can’t truly enjoy what is in front of me because I yearn for what has passed. Yet while I’m trying to balance in Crow there are no thoughts of the previous Downward Dog. That would be silly because I need to focus on not falling over right then and there. So, why can’t I focus on the present and what I need to achieve happiness today? I need to appreciate myself in the present the same way in real life I do on the mat. I need to give myself a break in real life. It’s ok that my kids don’t eat picture perfect meals the same way it’s ok that my hamstrings are as tight as a board. It’s ok that I’m not crafty the same way it’s ok that I can’t bind. Yoga is much easier if I breathe, I’m sure life would be easier if I breathed once in awhile and just appreciated the way it feels to be completely centered. 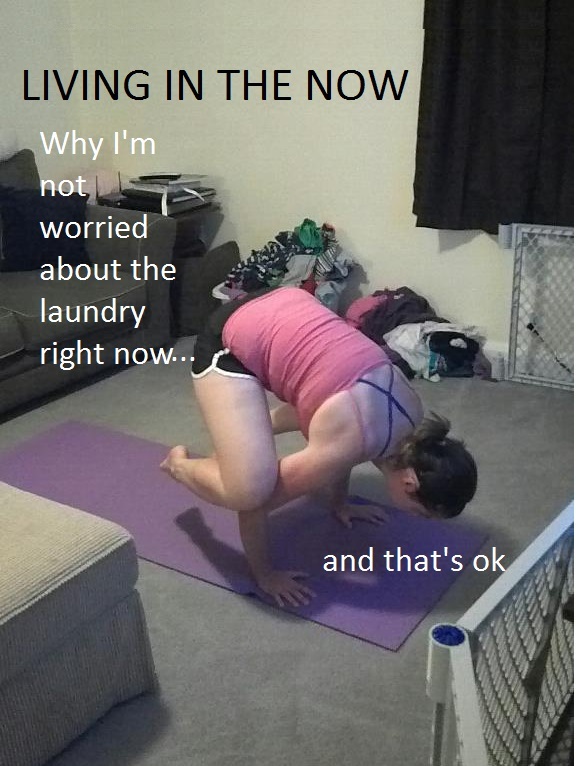 As I come away from a difficult couple of days, I realize that I need to incorporate my yoga beliefs into real life. I need to see every moment for what it is, good or bad, difficulty or easy, busy or relaxing. Not everything has to be perfect but it is real and real is good. While I was pregnant I read a lot of books. Books about pregnancy, books about parenting, about sleeping, about feeding, etc etc etc. Then Molly came and I learned that I wasted a lot of time. Molly doesn’t fit into a mold and she definitely doesn’t care about what the latest experts have to say because she has her own game plan. Of course it would help if she could hand over her user manual, but she won’t, so until then I just watch and learn and hope I’m picking up the right lessons in life. 1. Cereal is appropriate for any meal or snack. Also, surprisingly, you can survive on said diet and have rock hard abs. I might make millions one day from marketing it as the newest diet fad. 2. Surround yourself with people and things that make you happy. Never in my life have I met someone that openly avoids things and people they dislike. I think how much better life would be if adults could have the same kind of freedom. 3. The world is a scary place and there is nothing wrong with carrying someone that needs your help or asking to be carried. 4. Headphones don’t need music attached. Sometimes they just block out the world. Maybe I should just buy ear muffs for her. 5. Sleep is vital. I actually knew this one and am really happy my children agree and get a good 12 hours a night. I can be kind of bitchy and whiny without sleep. 6. Noises are awful, unless she is making it. Apparently loud banging or high pitched shrieking is okay if you make the noise. Anyone else is unacceptable. 8. Pick your battles. This goes for the kids as well as adults or other parents. Sometimes it really is easier to say “Ok” even when you don’t agree and save your energy for the things that matter. 9. No matter what the weather is outside, clothing is optional inside. .
10. Rules are made to be followed. However, feel free to bend them as much as you can get away with. Never in my life have I met someone that can follow rules so closely but then manipulate her way into breaking them without actually breaking them. I need to learn a few lessons of manipulation from this girl. Case in point, we started a house rule about inappropriate touching. After discussing it Molly asked for a hug and then proudly announced that “My chin touched your boobies!”This girl is clever.